2018 was a big year for us at the Luminos Fund. Through our Second Chance program, we were able to help 11,457 children get a second chance at a bright future. Children like Nathan and Mechan who, both at age 12, were able to rejoin their peers at school and find encouragement, support, and mentorship from teachers, family, and us. Each child we are able to support has their own unique story about why they left school, be it financial limits, family hardships, or conflict. What’s exciting is that these stories no longer stop there. 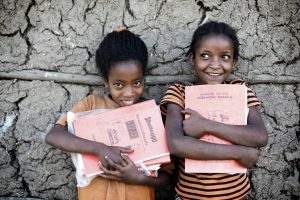 For example, an incredible 97% of our students in Ethiopia transitioned back into mainstream school after just 10 months catching up through our Second Chance program. In 2018 we built upon the incredible success of the Second Chance program in a number of ways. In Ethiopia, we began partnering with the national government to train their teachers to implement our unique model of instruction. In Liberia, we built out a new child protection curriculum for children and parents. And in Lebanon, we expanded our arts education work, providing more ways for our refugee students to reflect on their arduous journeys through creative self-expression. The work across all three countries reflects continuous innovation within the context of our core values of providing joyful learning to children in some of the toughest corners of the globe. Most importantly in 2018, we gained proof that the lives of children in our program are transformed for the long term. A six year external evaluation from the University of Sussex showed that graduates of our program are completing primary school at almost twice the rates of their peers. We’re excited about these program developments because we know the economic impact that our work has. One extra year of schooling increases an individual’s earnings by up to 10% and the effect can be double for women according to UIS and World Bank. When we see that 97% of our students transition back to school, we know that with every year, their opportunities grow, as do their dreams. Subsequently, each additional year of schooling raises the average annual GDP by 0.37% (UIS). While we love the numbers, we love the students even more. You can meet some of our students and read their stories, highlighting the resilience of the kids and families we work to support, and the commitment of Luminos Fund teachers, partners and donors. If you’re interested in hearing more about the kids we work with, the teachers who support them, and the next part of these kids’ stories, follow along on Twitter, Instagram, and Facebook. Nathan, Mechan, and the 11,457 other children were given these opportunities thanks to the support and contributions of our donors. We can’t thank them enough for making our mission of giving children a second chance at education a reality. Want to learn more about how rich education is possible, even in the poorest corners of the globe? Visit our website to learn, participate, and find out how you can help.